Blackburn Click is easy to install and shines brightly. When I say any light is better than none, I mean it. Recently I have seen (barely) cyclists pedaling along at night with NO lights and NO reflectors, wearing dark clothing. These people will not contribute to the gene pool, if they keep that up. So when my aging tail light’s on/off button became non-functional, I had to buy a new one. I purchased two lights for two bikes, both Blackburn brand lights – the Click and the Mars 3.0. Blackburn has a reputation from making bike racks since 1977 and has since expanded to everything under the sun. I initially wanted to use the Mars on my daily road bike, but it proved to be a complicated affair. You can orient the light vertically or horizontally. Horizontal mounting is easy, but vertical mounting is a chore. You have to disassemble parts and reinstall. Then I discovered the light wasn’t vertical but at an angle and I didn’t like that. The screw clamp also seemed over-complicated. 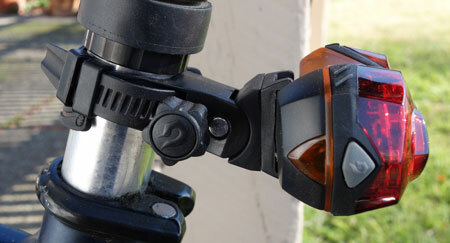 In contrast, the Click has a rubberband-style clamp. It’s oh-so easy to mount. It’s also easy to turn on and off. Just press on the light face and it’s on. One click gives a solid light and two clicks a blinking light. I settled on the Click. It’s plenty bright and battery life matches the Mars. Click costs about $15 and the Mars 3.0 about $17. One final note. I’m not a fan of the blindingly bright flashing front white lights. Some are so bright they distract drivers, based on personal experience. While I don’t know of flashing bike lights being tested in court, flashing lights are supposed to be used only on emergency vehicles. 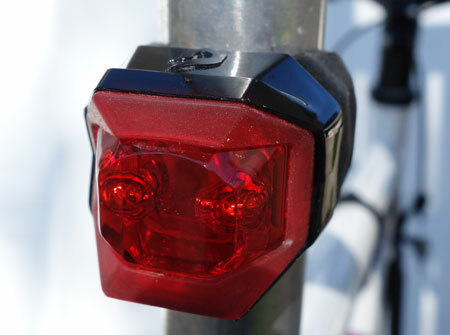 I don’t think a flashing red light on a bike is a problem, but I do believe flashing front lights should not be used. Flashing lights are OK on bicycles, at least in California, because according to the vehicle code bikes are not vehicles: VC Section 670. A “vehicle” is a device by which any person or property may be propelled, moved, or drawn upon a highway, excepting a device moved exclusively by human power or used exclusively upon stationary rails or tracks. Flashing lights, by the way, double battery life. Blackburn Mars works well, but mounting can be a chore. This entry was posted on January 1, 2013 at 12:00 pm and is filed under Products. You can follow any responses to this entry through the RSS 2.0 feed. You can leave a response, or trackback from your own site. My biggest problem with tail lights is my own absentmindedness. Either I would start a ride while light and forget to turn on the tail light after dark, or I would start the ride in the dark and forget to turn it off after light (so it would blink all day, even after garaged, and surprise me with a dead battery when starting the next ride). I have found one tail light that works for me better than all the rest: the CatEye Reflex. The key features is that it has a light sensor that automatically turns it on in the dark (at dusk) and turns it off in daylight. PLUS it has a motion sensor so that if you park your bike, the light turns itself off automatically. I also use a dynamo powered front light, so I never have to think about batteries. Our Bay Area winters are cold but not too much so to precluded riding. Good lights allow us to deal with the lack of daylight this time of year. I agree strongly with you Ray on flashing front lights. As a driver I find them very annoying–yesterday I fixated on a bicycle on the other side of the street and stopped watching what was right in front of me. Furthermore at night I don’t see how a light in flash mode helps a rider even see. I once tried my headlight on flash mode while riding down highway nine from Saratoga Gap–however I found it highly distracting the way it bounced light off of the road signs–it really broke up my concentration at 35 mph. This is a problem I don’t encounter with it’s on a steady beam.